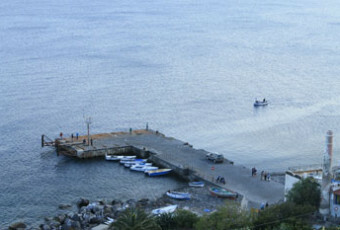 Alicudi is the most isolated and the most western among the seven islands of the Aeolian archipelago. For the itinerary which will permit you to start the discovery of its beautiful coasts, it is recommended an extreme attention to the meteorological conditions because there are no shelters and the first safety shelter is found in Lipari, around 30 miles to the south-east. The periplus of the island is of 6 miles and has no shelters; in fact, the sea surrounds the whole coastal lines. The lading of the island is that of Cala Palomba, of recent construction. It is found on the south-eastern side compound of a “T-shaped” pier, made of reinforced concrete, and of 10 metres long. In this area there is a sign light of white colour, equipped with laser scanners which permit the docking of hydrofoils, ferries, and the development of the island’s activities. The area adjacent the pier is completely lacking of services connected to navigation; there are neither water nor fuel supplies, nor buoy moorings. These services are available: cranes, garbage trucks, the post-office, a public call box, and some little food markets selling the essentials. For the boaters there is a small pier , about ten metres long, which permits moorings of fishing boats inferior to 1,5 metres. The visitors cannot avoid the island’s circumnavigation, the unique way to discover the inaccessible isles, the small caves and the wild eastern side which showed the mighty volcanic activity, imprinting irrevocably the mountain’s profile. Moving from the pier, in eastern direction, there is the beach adjacent the port. Alicudi is an island of semi-circular base; its coastal morphology is linear, without any creeks or strips of land which go towards the sea: that is why it is impossible to find any safety shelter during strong coastal storms. In the first stretch it is possible to admire the rock surrounded by towering cliffs, where one part of the village of San Bartolo is situated, up to the mountain, with its characteristic church of the nineteenth century and the partly uncultivated terraces. In Bazzina suburb, not far away from the other one, the seabed does not exceed 10 metres, and is a perfect place where to swim and to enjoy the luxuriant fauna which populates the seabed. To the north-east, after having passed Punta Rossa, called so because of its rock’s colour, you start to glimpse the unpopulated part of the island. It is about a harsh, wild and dark zone ,crossed by “Fili” (thin strips of already consolidated lava which, intertwining, harmoniously mark the mountain’s profile) and big valleys, excavated in lava. The great part of the western side of the island is totally inhabited and uncultivated, there are no paths which cross it and also the coastal zone is inaccessible because of high rock, obstructing the mooring. Going on, you will find Scoglio Galera. This area seems to be a continuation of the coast, and is animated by a variegated and multi-coloured marine flora. It is a magic place for those keen of snorkelling. The next step is that of Canalone dell’Arpa, a wide creek which, during eruptions, pours lava and debris towards the sea. At this point, only one step divides you from the Alicudi dock. Going all over this path it is possible to catch wonderful panoramic glimpses on the extreme point of Scario Vecchio, the former dock of the island, and of Arco Perciato, a natural arch-shaped rocky formation.